In the 30th anniversary edition of the Berlitz Cruising & Cruise Ships 2015 guide, EUROPA and EUROPA 2, Hapag-Lloyd Cruises' luxury ships, have defended their pole position and have been awarded the highest distinction as the only 5-stars-plus cruise ships worldwide. 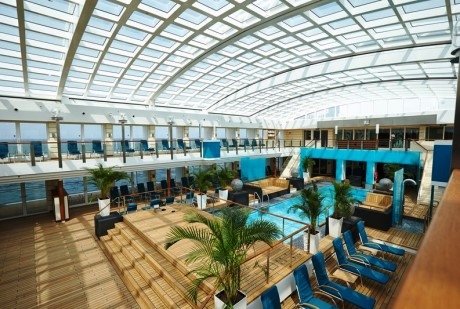 The HANSEATIC was ranked as the only 5-star expedition ship globally among the group of "boutique ships". Attaining 1,860 points out of a possible 2,000, the EUROPA 2 achieved the highest score among all ships and has been awarded 5-stars-plus for the second time. The EUROPA, which has achieved this award the 15th year consecutively, received 1.851 points. Hence, both ships lead the ranking in the category "small ships up to 750 passengers" and are global leaders. The HANSEATIC has been awarded 5-stars with a total of 1.765 points, the BREMEN received the distinction 4-stars-plus with 1.555 points. "Both are beautiful ships to sail aboard", comments Douglas Ward, author of the Berlitz Cruise Guide on EUROPA and EUROPA 2 "with an outstanding amount of space per passenger, high-ceilinged passageways, a superb range of dining venues and types of cuisine, and attentive, friendly, yet unobtrusive personal service. They have proven themselves to be unbeatable yet again." "For EUROPA and EUROPA 2 to be awarded 5-stars-plus again this year fills us with pride and is a very special certification for our performance and our standards of quality, which proves once more our role as the foremost provider of luxury cruises" says Karl J. Pojer, CEO of Hapag-Lloyd Cruises. "A special thanks therefore goes to our crew on board the ships as well as our team of staff in Hamburg." The 30th anniversary edition of Berlitz Cruise guide is published on October 1st. Author Douglas Ward and his team tested a total of 270 cruise ships around the world and scored them based on criteria such as ship fittings, menus, restaurant quality, service, crew, entertainment and the cruise experience. For the first time, the guide includes a special on themed cruises this year.